Introducing the 2015 Inspiration Team! Thank you to everyone who has joined in on our Inspirationals this past year! We’ve had a lot of fun inspiring you to pick up your stamps and create! It’s time to introduce to you our new Inspiration Team for 2015. But first, we must say goodbye to one of our 2014 team members. 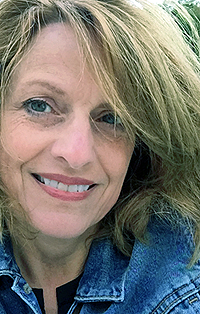 Kendra Sand has done a wonderful job over the past year and I am sad to see her go. Thank you, Kendra! 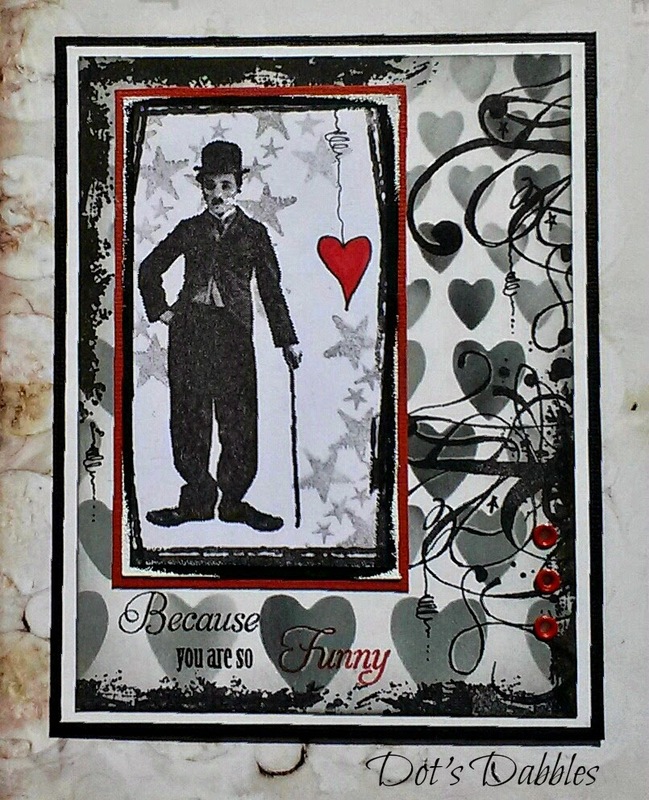 You can visit her blog here: Luv 2 Scrap n’ Make Cards. 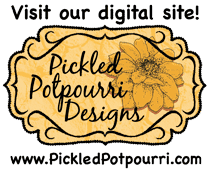 I am happy to tell you that Lynda Lindley (Blog: Positive Force) and Andrea Slee (Blog: Drea’s Scraps of Inspiration) are both staying on for 2015! They’ve done a fabulous job this past year, wouldn’t you say? And I’m glad to see them return for another year. Also a big thank you to all of you who submitted your applications for the 2015 Inspiration Team. We had a lot of great designers to choose from, which made it very difficult! And now I am thrilled to introduce to you two new designers for our 2015 Inspiration Team! 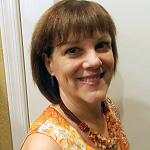 Hi I'm Barb Thompson and my journey into stamping came about 6 years ago when my husband retired, I quit working and we moved to a smaller town in Arizona. I needed a hobby so my sister who is a long time scrap booker and stamper gave me a kit and a few lessons on stamping and as they say I was hooked! My specialty is card making and love coloring with Copics. I hope I can inspire you to dig out those stamps and use them. Hello, my name is Melissa and I live out in the country of a very small town located in Illinois. I'm happily married and my husband and I have four children, 3 boys and 1 girl. We also have quite a group of pets including 6 dogs, a cat, and a horse. I started getting into paper arts about twenty years ago when someone suggested I scrapbook. Little did I know that scrapbooking would be the stepping stone to my paper arts addiction! Everyday that I can I'm working on some project, it's not just a hobby, it's become a way of life for me. When I'm not involved in a paper arts you can find me volunteering for animal rescues (answers the question about all the dogs, right). I also ride hunter jumper, do a lot of reading, and am on the local school board. 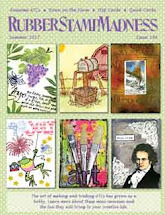 I am so excited to be joining the Red Rubber Designs Team and do hope that I will inspire you to stamp along with us. Please join me in welcoming our new 2015 Inspiration Team! Thank you to everyone who participated in our Inspirational #207! Such beautiful projects from everyone! Each week the Inspiration Team choose three projects from all of the just-closed Inspirational participants, These projects are chosen because they truly capture the essence of the Inspirational. Congratulations to the creators of our three Inspiration Projects from Inspirational #207! Very striking colors, and awesome stamping!! 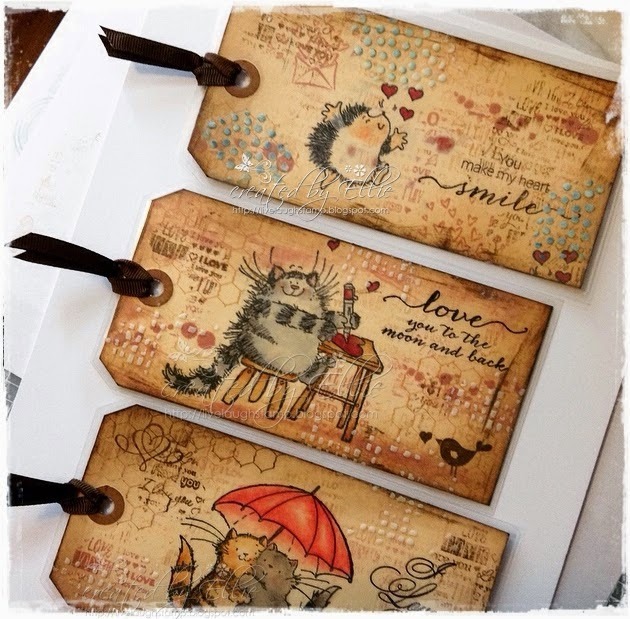 Wonderful mixed media on these adorable bookmarks! Clever idea highlighting some of the sentiment on this fantastic card! All of our Inspiration Project creators are entitled to an Inspiration Badge for their blog! If your project is chosen as one of the Inspiration Projects, please send an email to - challenge AT redrubberdesigns DOT com - to collect your badge. Please include your name and the Inspirational number your project was created for. There is still time to join in our current Inspirational #208 Let's hear it for the girl hosted by Lynda. Please link up your project by 11:59 PM ( U.S. Central time zone) on Wednesday, February 25, 2015. And don't forget our next Inspirational starts on Thursday, February 26th!! Deadline for submitting your projects is Wednesday, February 25th at 11:59 PM US Central time. This is Lynda hosting this week's Inspirational! Our theme this week is Lets hear it for the girl! I am looking for a stamping project with a feminine theme; it could be imagery, sentiment, or coloring! I have a birthday gift to give to a good friend later this week, so I created this tag that will go on the gift bag. I first decided that I wanted to make the tag and determined the size. I then printed this digital sentiment onto the cardstock. This sentiment is from the Nature's Greetings set by Pickled Potpourri. I then trimmed the piece and stamped the flower from the Spring Dream set onto the tag base. I then colored it with my Copic markers. To make it more girly I added some glitter to the edge, leaves and body of the flower. For the flower center I used some thicker tinsel glitter. I think my friend will love it...what girl doesn't love a bit of glitter on her birthday!! Thank you to everyone who participated in our Inspirational #206: ! Congratulations to the creators of our three Inspiration Projects from Inspirational #206! We liked the masculine feel to this and all the hearts in the background and on the main image. The hearts dangling from this tree are amazing as is the design on this wonderful card. The heart overload on this card was perfect for the challenge, along with that cute image...even the kitty got in the heart action! There is still time to join in our current Inspirational #207 So Sentimental hosted by Drea. Please link up your project by 11:59 PM (U.S. Central time zone) on Wednesday, February 18, 2015. And don't forget our next Inspirational starts on Thursday, February 19th!! Deadline for submitting your projects is Wednesday, February 18th, at 11:59 PM US Central time. This is Drea hosting this week's Inspirational! Our theme this week is So Sentimental! Simply stamp any kind of sentiment on your project. I started by misting some white wood paper, and then stamping the background using Vintage Backgrounds. 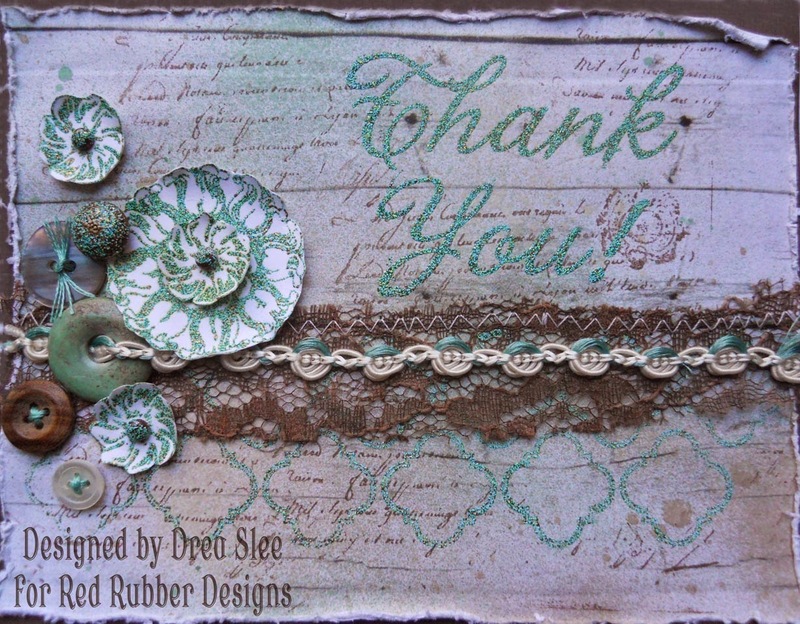 The rest of my stamping was embossed for the flowers that I made with Medallions, the border along the bottom using For Everything, and the Thank You sentiment. Then I added some lace, trim, and for extra sentiment, all of the buttons, which once belonged to my MIL's mother, including the circle stone that the trim is through. Kendra got sentimental with this lovely card that she made. 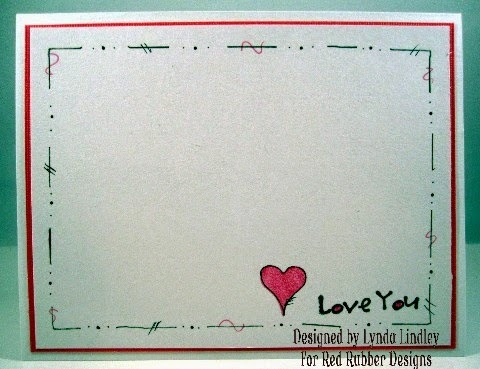 She used Mini Script and I Heart You rubber stamp sets. Thank you to everyone who participated in our Inspirational #205 CAS (Clean and Simple)!! Such awesome projects from everyone!! Congratulations to the creators of our three Inspiration Projects from Inspirational #205! Super fun CAS card! Love everything about it....design, image, sentiment!! Perfect! Another lovely design! Breathtaking! Love the added heart! Lovely design! The hearts and pearls add the perfect touch!! There is still time to join in our current Inspirational #206 - Love Is In The Air hosted by Lynda. Please link up your project by 11:59 PM (U.S. Central time zone) on Wednesday, February 11th. And don't forget our next Inspirational starts on Thursday, February 12th!! Deadline for submitting your projects is Wednesday, February 11, 2015 at 11:59 PM US Central time. This is Lynda hosting this week's Inspirational! 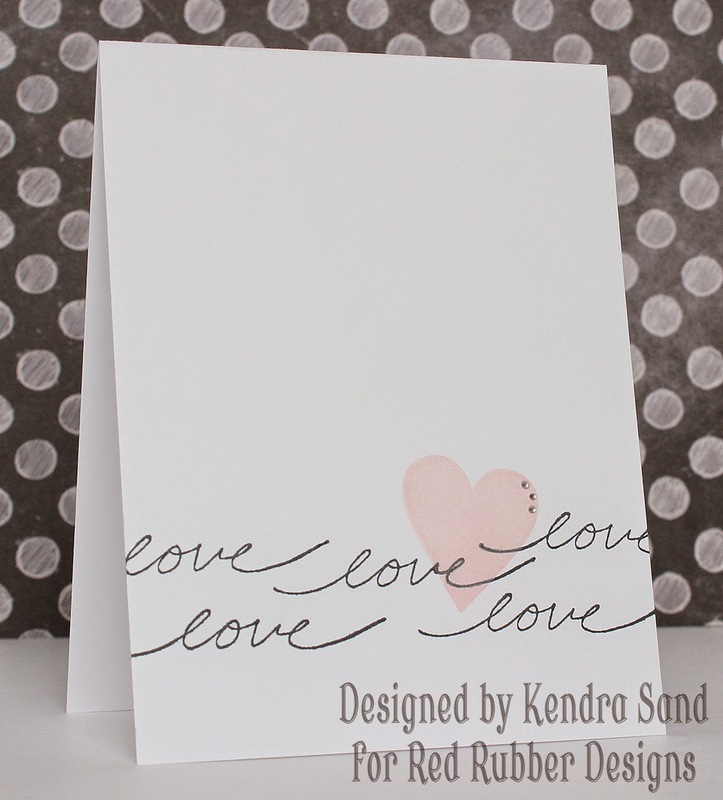 Our theme this week is Love is in the Air...so I want to see a heart somewhere on your stamping project. Please remember that you must stamp on your project; so please include something in your writeup that tells us about your stamping! For my card I started with the Love You sentiment from the Circles of Love and stamped it on the bottom right of the cardstock. I then added the heart from the Pick a date next to the sentiment. I then doodled the border around the edge of the card. 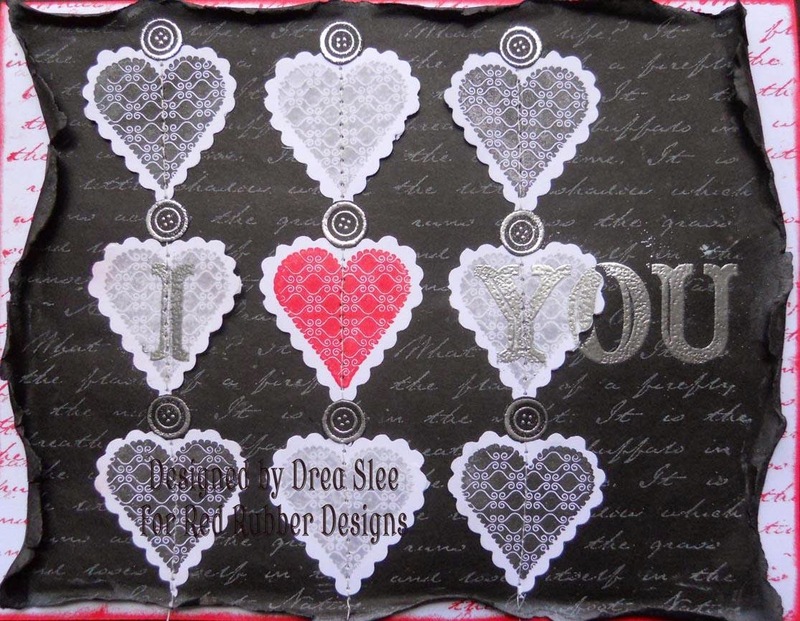 Drea created this fabulous card using images from the I Heart You, Script Background, and Sew Thoughtful stamp sets. Thank you to everyone who participated in our Inspirational #204 ! Congratulations to the creators of our three Inspiration Projects from Inspirational #! We really like the tree that is made from stamped paper! 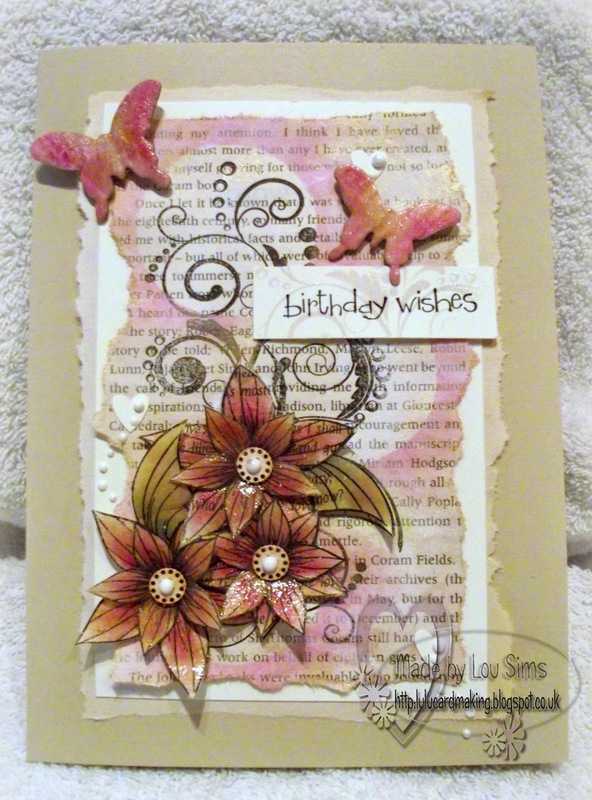 These wonderfully stamped and colored flowers really stood out on this wonderful card! 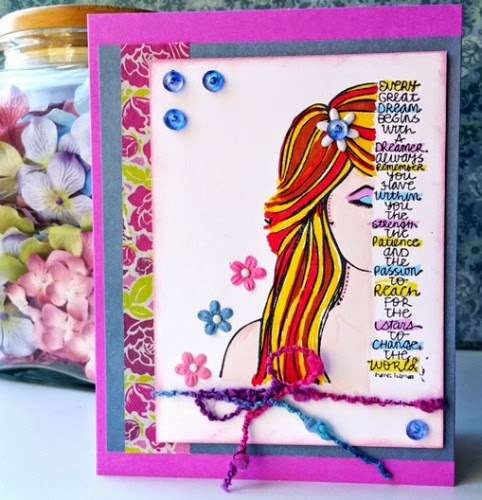 We really liked the use of color and all the different stamps used on this project! There is still time to join in our current Inspirational #205 CAS hosted by Kendra. Please link up your project by 11:59 PM (U.S. Central time zone) on Wednesday, February 4, 2015. And don't forget our next Inspirational starts on Thursday, February 5, 2015! !